Artist Statement: I have been weaving for over 40 years. While growing up my family made use of all the baskets my father and uncle made from willows that they grew especially for this purpose. It took several spring seasons of my uncle showing me the basic techniques of basket weaving for me to get hooked on willow weaving. After that I started growing my own and later expanded my weaving skills by taking classes with master basket weavers from the Amanas, England and Austria. 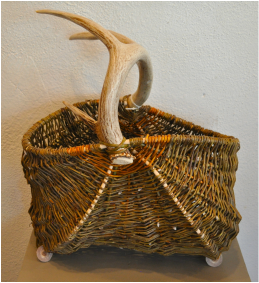 I have enjoyed the creative challenges of making new forms and one-of-a-kind baskets and sculptures. Most of my weaving is done from the late Fall into early Spring during the time when my willow trees are dormant. Each tree is cut back to its trunk so only first year growth is used. Itʼs always great fun to see the shape envisioned take form!